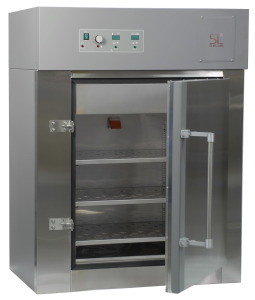 This unit incorporates a refrigeration system that dramatically increases the operational range of the cabinet. A low-pressure water vapor generator, injecting saturated water vapor into the recirculating air duct, controls chamber humidification. This process is preferable to steam generation because steam introduces additional heat to the chamber atmosphere, which then compromises temperature control. Uniform temperature and humidity are maintained by circulating chamber atmosphere through a recirculating air duct system. The air ducts also serve as shelf supports and can be easily removed for cleaning. Please note this unit needs to be plumbed with distilled water or filtered tap water. Water resistance must be in the range of 50K-1M Ohm/cm or conductivity range of 20.0-1.0 uS/cm. If your laboratory cannot support this water quality, purchase the SHEL LAB Water Purification Kit. See the installation and operation manual for more information. All specifications are determined by using average values on standard equipment at an ambient temperature of (22 ± 3)°C and line voltages within +/-10% of unit type (115V/230V). Temperature specifications follow DIN 12880 methodology. We reserve the right to change specifications at any time.